Ganden is named after the Tushita heaven where the future Buddha Maitreya, presently a bodhisattva is residing. Ganden monastery is one of the three largest Gelugpa school monasteries near Lhasa. The two other are Sera monastery and Drepung monastery. Ga means Joy and Den means to Remain, it's a joyful remain retreat area. When Je Tsongkhapa was staying at the retreat area in the Woka Choelong. Once when he was resting on the stone and facing towards the direction of the southwest, where he achieved prophecy of establishing the Ganden monastery in that direction. Later in the year 1409, Je Tsongkhapa Lobsang Drakpa founded the Ganden monastery and the retreat area. Je Tsongkhapa stayed at Ganden for many years teaching Dharma and retreating. Je Tsongkhapa passed away at Ganden monastery. The gold and silver tomb of Je Tsongkhapa is well preserved at Ganden monastery. The name Gelug means positive karmic path. It was actually Ganden lug or Ganden way or path or tradition. The Ganden monastery is famous for the golden throne holder of Ganden. The first Ganden Tripa was Je Tsongkhapa. The second Ganden Tripa holder was Gyaltsab Je, and the third Ganden Tripa holder was Kedrup Je. Gyaltsab Je and Kedrup Je are the two main disciples of Je Tsongkhapa. The beauties of Ganden Tripa is anyone can be a Ganden Tripa if that person has great wisdom. It will take around more than forty years of diligent learning and practicing Mahayana Buddhism to become the great Ganden Tripa. Most of the Ganden Tripa's were around fifty-sixty years old when they became the Ganden Tripa golden throne holder. They were also some wise Ganden Tripa's who became Ganden Tripa after having diligent learning and practicing the Mahayana Buddhism for around twenty years. There is an old Tibetan saying; If mothers son has wisdom, the golden Ganden Tripa seat is ownerless. Travelers can witness the beauties of Golden Ganden Tripa throne when visiting the main assembly hall. Two of the main relics of the monastery is the tomb of Je Tsongkhapa and the golden throne of Ganden Tripa. The monastery has a Jamkhang (chapel of Maitreya Buddha). The location of the Ganden monastery is at the Takze county, around 60km from Lhasa towards the east at the altitude of 4300 meters. Ganden monastery is located on the mountain namely Wangbori. This is the beauty of the monastery that the whole view can be seen from the kora Lingkor hiking route. The Ganden monastery Kora hike is one of the main recommendations from Tibet Travelers. I still remember the days when I took two Singapore Travelers to the hike at Ganden monastery Kora Lingkor route. After every few stops, they keep saying wow and wow so that gave me the energy to share this beautiful hike to Travelers and also they are some Travelers with children being bored with so many monasteries so I have recommended the Ganden Kora hike to them and they also love it a lot. The kora hike is around 5-6km with a hiking duration of around 1-2 hours at the altitude of around 4500 meters. The hike allows Travelers to see the beauties of the whole valley and the mountains with the view of far villages passing by the river. Most of the tours in Tibet are focused on overland tours spending many hours in the vehicle so hiking at Ganden monastery is a great option for Travelers. Tibet Travelers has focused on four different types of tours with the Ganden monastery and the kora Lingkor route hike for Travelers on our website. Ganden monastery is one of the genuine monasteries in Tibet. The monastery is full of blessings from the great Tibetan masters from Gelug school. The Kora Lingkor route was once the retreat area of the masters. It is said that they used to meditated there even in the night during the rainy or snowy season. The diligent of these great masters have left lots of blessing for the Travelers. The Kora Lingkor hike route at nearly the summit of the Wangbori mountain allows Travelers to enjoy the stunning beauties of the whole valley like a view from the bird's eye. 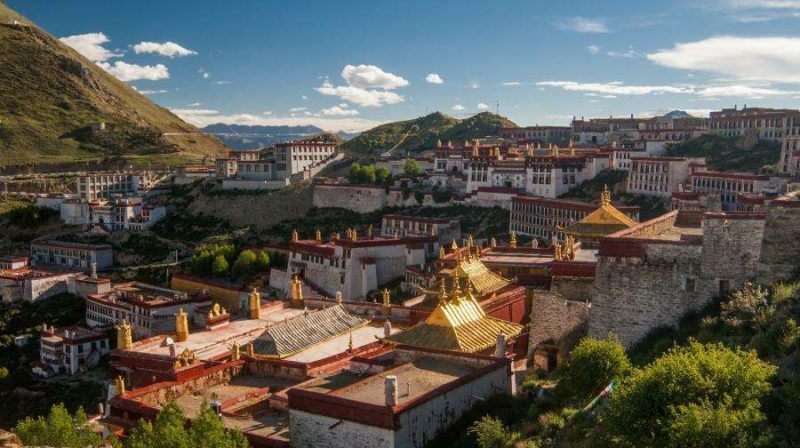 Ganden monastery, Sakya monastery, Ralung monastery, and Samye monastery are few of the great monasteries recommendations from Tibet Travelers to all the Travelers around the world. 89 queries in 0.308 seconds.